Zounds, have you heard about the Golden Dragon that lives in yonder cave? Click here to play! Nay, you have not? Well, in that case, I'll stop speaking like a medieval idiot while I tell you about it, shall I? The beast is made entirely out of gold, or so I've heard. Well, there are apparently a few parts made of other things, but they're made of diamonds, sapphires and rubies, so it's all much of a muchness, really. Regardless of what precious metals and gems the Golden Dragon is actually composed of, you can bet there's a pretty penny to be made by killing the thing and chopping it up into saleable bits. So, here's what you do. You take that sword and shield of yours, walk over to the Golden Dragon's lair, take a deep breath, then hit the creature until it stops moving. Will it struggle, you ask? Of course it will, but it's made of gold, famously weaker than steel, and you have a big shield to stop its tail from hitting you. There are stories that say it breath molten gold... but you can storm that bridge when you come to it, eh? Alright, there is one other option. 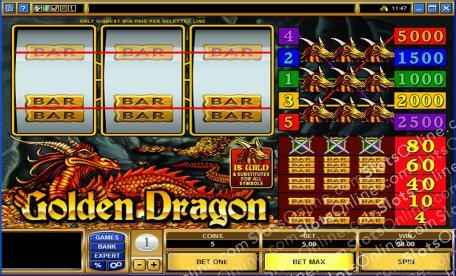 The Golden Dragon does run a casino, to distract all of the adventurers that come after it. Perhaps you could play the Golden Dragon slots and win a big jackpot rather than try to kill a 50ft tall dragon? The Golden Dragon symbol is wild in this game, and it can substitute for any other symbol.